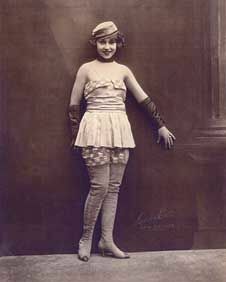 At age 14 in 1918, according to Wikipedia, Doris Eaton became the youngest Ziegfeld Girl ever to be cast in the Follies. Wikipedia gives her birth date as 14 March 1904.
left — by Moffett, labeled by my source “age 19” which would be c. 1923, but this is probably incorrect — I suspect that my source might have mistaken 1919 for age 19. It’s more likely that Eaton was about 15 when the three photos were taken. Lending support to this conjecture is the fact that Eaton’s last Follies appearance (at least on opening night), according to IBDb, was in 1920 at the ripe old age of 16, though she performed in several additional Broadway productions from 1924-1935. When her career in stage and screen declined, she started a second career as an Arthur Murray dance instructor and local television personality in Detroit. Her association with Arthur Murray lasted for three decades, during which time she rose through the ranks to own and manage a chain of nearly 20 schools. After retiring from her career with Arthur Murray, she went on to manage a horse ranch with her husband and returned to school, eventually earning several degrees. In her later years, Travis had returned to the public eye. As the last surviving Ziegfeld Girl, she was featured in several books and documentaries about the Ziegfeld Follies and her other stage endeavors. Eaton Travis had also returned to the stage as a featured performer in benefit performances for Broadway Cares/Equity Fights AIDS. As of 2010, says Wikipedia, Doris Eaton Travis was, along with Miriam Seegar and Barbara Kent, one of the last surviving non-child actors who appeared in silent films. She died, age 106, on May 11, 2010.